Before you know it, your students will soon be penciling in their answers on the big state standardized test. Make sure your students are ready and relaxed to take on their writing test with these top 10 tips from WritingCity! Wait, What? Writing Across the Curriculum Can SAVE Time? What if we told you that writing across the curriculum could save you time? As the school year comes to a close, teachers are already thinking and planning for next year. We, as teachers, look forward to a fresh start and are trying to remember all the mental notes we took during the school year about what to do differently to make next year even better. We encourage teachers to make time at the end of the year to reflect and set goals. It is a good time to teach students to do so as well. Second, there was the issue of motivating all of my students. Some students were difficult to motivate, especially for writing. I fought the battle for years. I’d run through hoops to create some kind of excitement when it came to teaching writing skills. I tried mentor texts, dressing up in costumes, and more. They worked, but wow, they took up a lot of time. I’d give the lesson and find that there was very little time left for actual writing practice. As the years went by, I tried new teaching strategies to build successful writers. Let’s Get Something Straight! Not STR8! I’ve noticed an increase in “texting” type lingo in student writing. I’m not talking about when students text each other in on the go instant messages, or write short Tweets that are limited in the number of characters that can be used. No, I’m talking about when students write and are publishing their work to a broader audience. Formal writing deserves more than text type language. Posted in The Inspired Writer Blog, Write With JoannaTagged capital letters, formal writing, grammarLeave a Comment on Let’s Get Something Straight! Not STR8! In August, I traveled across the country to Eugene, Oregon. I had the opportunity to visit McCornack Elementary School, just one of several schools in the 4J District. I was immediately welcomed by smiling faces, even though the school year had not started. I noticed the dignity wall, where students agree to treat others with respect and the Principal’s Wall of Pride. The signs of a caring school community made me feel at ease, even in a school far away from home. Many teachers, as they do in all schools, were busy setting up classrooms well before the first day of school. This is just one of the many signs of dedicated hard working teachers I see when I visit classrooms all over the country. Happy Teacher Appreciation Week! I’d like to take a moment to tell you how much I appreciate the work you do. As a former teacher, I understand the sacrifices you make. I also know the positive impact you make on your students’ lives daily. How Does Technology Affect Student Writing? Take a look at the world around you today and compare it to twenty years ago. What do you notice? I notice how technology has changed so many aspects of our lives. Now, compare when you were first learning to write to present day students learning to write. How has technology affected student writing? Below I’ve outlined the pros and cons related to technology and the effect it has on student writing. No matter where you live in the world, writing is an important skill to master. We were contacted by Open Colleges, an education company based in Sydney, Australia, who asked us to share a blog from their Community Manager, Tess Pajaron. We were happy to do so. It shows two countries think alike when it comes to writing! Read on to learn Tess Pajaron’s tips for encouraging students to write more. When it comes to education, writing is an important part of every subject. Writing allows students to practice crucial learning skills like integrating new information or reframing their knowledge in logical structures. It also enables instructors to identify issues that students find difficult to understand. The best thing is, writing doesn’t have to come in large pieces like term papers. Using some of these shorter assignments, teachers can effectively encourage their students to write more and polish their language skills. Visit any elementary school classroom and most likely you will find a copy of Shel Silverstein’s Where the Sidewalk Ends. It was one of my favorite books during my younger years. I enjoyed reading the short poems chock full of words that sounded like music to my ears. Since it’s National Poetry Month, I want to share some poetry lessons with you. Is Anybody Listening to Teachers? Vivian Maguire is an English teacher at Transmountain Early College High School in the El Paso Independent School District. Her post was originally published on June 10, 2014 in Education Week. Thank you Vivian for letting us share your article! Check out her blog, StoryMother, or follow Vivian on Twitter: @maguireteacher. I am an English teacher who has been in the classroom for nine years. As an experienced educator, I have endured and complied with many new school policies and changes, most of which mainly affected teachers. But earlier this year my school was informed of some changes that would ultimately affect our students, and that I couldn’t stand for. The district had decided to cut teachers’ planning time in half by instead sending teachers into other teachers’ classrooms to serve as aides. The assumption was that teachers are not using that time effectively anyway so why not put two teachers in every classroom? Posted in The Inspired Writer BlogTagged planning periods, teaching, teaching struggles, time limitationsLeave a Comment on Is Anybody Listening to Teachers? Education is a 7 Trillion Dollar Industry? Did you know this? I had no clue until I went to the Education Innovation Summit in Scottsdale last month. Watch the interview I participated in to hear my take on the future of EdTech and what it means for the education industry. Posted in The Inspired Writer BlogTagged Ashton Kutcher, Clever, Edtech, Education, Education Innovation Summit, funding, future of education, SwivelLeave a Comment on Education is a 7 Trillion Dollar Industry? Posted in The Inspired Writer BlogTagged coaching, professional development, writing challengesLeave a Comment on Professional Development & Common Core Writing: What Works? John Rumery, Editor of Rapid Growth, interviewed Suzanne Klein (Founder & CEO) about WriteSteps. Watch the video to discover Suzanne’s inspiration for creating WriteSteps, information about investing in the growing company, the top three challenges teachers face when it comes to teaching writing, and her plans for WriteSteps’ future! Standards based assessments call for both types of Response to Text writing. Arlynn King and I continued our conversation on Smarter Balanced and PARCC testing with an emphasis on text-dependent vs. non-text dependent questions. Non-text dependent questions ask students to communicate their own thinking, self expression and exploration. Text-dependent questions ask students to respond to sources and answer questions by drawing on evidence from the text in support of their ideas. We came across this blog, written by Pam Allyn, Founder of LitWorld, and wanted to share it with you as a guest post in The Inspired Writer this month. If you haven’t heard of LitWorld, check out this global organization that advocates for children’s rights as readers, writers and learners, here. Enjoy these ten writing tips from Pam! The teaching of writing can be formulaic, but this era requires us to step beyond the confines of formula and really dig deep into craft, synthesis and production. Have you ever been asked to create curriculum when you felt like you went to school to teach? In an effort to save money, we have heard some districts are having teachers work collaboratively to design daily lessons for the state standards. This poses a problem. When are teachers going to find time to create top notch standards based lessons when they are in classrooms every day? There are two ways districts think they are saving money. One is they are trying to find free standards based material for their teachers to use. The other is they are asking their teachers to be curriculum creators. Now don’t be penny wise and pound foolish. Districts might save one penny now, but waste pounds of pennies later on when they realize their plan to save money backfired. Read on to hear my opinions on why I believe districts should make curriculum decisions with their eyes wide open. At WriteSteps, we realize the importance of integrating technology into elementary classrooms. Students have higher motivation, immediate access to quality instructional materials, and increased engagement. Utilizing technology in your classroom also prepares young students with the skills necessary to succeed in our technology driven lifestyles. Technology provides teachers like you with an unlimited wealth of resources and tools to teach and expand your knowledge; there is no limit to the resources you can use to help your students in today’s information age! I am a firm believer that students learn best by example. In our WriteSteps K-5 Common Core program, we provide teachers with real student t writing samples demonstrating the different writing topics students learn. We include low, medium and high quality samples so students can see all levels of works. Picture books can also be a great way to demonstrate a specific writing skill to your students. If you are looking to supplement your writing lessons, in addition to the student writing samples provided in our daily lesson plans, here are some good suggestions. Below you will find five examples of picture books and how they can be used as mentor texts when teaching a particular writing skill to your K-5 students. The question to date was whether or not adolescents were able to switch between writing text messages and using correct English grammar for class work. The results of this study indicate that most adolescents are not able to do so. Guest blogger Chris Drew is the founder of Pocket Literacy Coach, an innovative resource that provides parents with literacy activities to do with their children. A friend of mine, Suzanne, at WriteSteps recently shared a story about how “Texting May Undermine Language, Spelling Skills.” It’s an interesting summary of a new study about correlations between “techspeak” and grammar test performance. We had a friendly back and forth about our disparate perspectives on this issue. In a nutshell, she generally supports the claims of the article, and I do not. The issue of texting impacting language and grammar skills is much more complex than this one story would lead us to believe. As pop news reporting on academic research usually goes, though, the author, Rick Nauert, doesn’t quite flesh out the whole story from a much larger context. WriteSteps Curriculum Creator Katie Davis meets the Common Core technology requirements for publishing K-5 writing with a simple and engaging blogging platform. Last week, we published “4 Free Technology Tools to Jazz Up Writers Workshop” in the August issue of Inspired Writer. If you missed, it you’ll definitely want to check out these powerful motivators for young students developing Common Core writing skills: StoryBird, Little Bird Tales, ePals, and iMovie. Then, if you haven’t found your way into blogging yet, try another publishing option your students will love: a free blogging platform that’s so simple, even first graders can use it! Our fourth-grade curriculum creator, Katie Davis, recently gave WriteSteps Coaching Director Arlynn King the scoop on Kidblog. Why do America’s children write so poorly? Writing instruction has seen a lot of innovation since I was a kid. Like many of my peers, I struggled with writing under the old system of the 3 A’s – assign, assume, and assess. My teachers assigned a topic, assumed we could write about it, and assessed our finished pieces. Today’s kids have it better. Yet there’s still a disconnect. Despite the advances in instruction since I was a child, most teachers still don’t teach writing well. On the last national writing assessment (the NAEP), less than a third of 12th graders, and less than a quarter of elementary students, could write proficiently. Suzanne Klein presenting at March, 2012 NAESP conference. A report on Suzanne Klein’s Common Core writing presentation to the National Association of Elementary School Principals. I was drawn to this breakout session not only because Common Core was included in the title, but because writing is an area of challenge for my school, and from what I understand from my peers, for many others. How many schools have a dedicated “writing time”? Binder of 3rd grade writing samples collected by Denise Dusseau for next year’s class. Once teachers have a strong foundation in the WriteSteps lessons, collecting class samples can be a great way to honor student work and help your evaluations. Denise: WriteSteps provides dozens of excellent anonymous samples for each grade, but I started creating my own collections when I was still using the Lucy Calkins program. Whether or not you already have plenty of anonymous student sample writing to use in your lessons, using samples from your own students can be powerful. Why? Today’s blog features simple and effective teaching tips from our 3rd grade Curriculum Creator, Denise Dusseau. Denise is a gifted classroom teacher who used the Lucy Calkins writing program until we launched the Standards Based WriteSteps in September. She reported in our December Inspired Writer eNewsletter that since she started using WriteSteps, even her struggling writers are making wonderful gains! A quarter of her students have learning disabilities and/or ADD. Conferencing individualizes instruction and reinforces new skills, ultimately helping K-5 students discover their power as writers. Is the Pencil Becoming Obsolete? Though K-5 students are required by the Common Core to practice writing with digital tools, writing by hand does far more to stimulate brain development. Helping children become stronger writers while making sense of the Writing Common Cores can be challenging. WriteSteps offers techniques that bring teachers and students success; this is what we want to discuss in our newly launched blog. 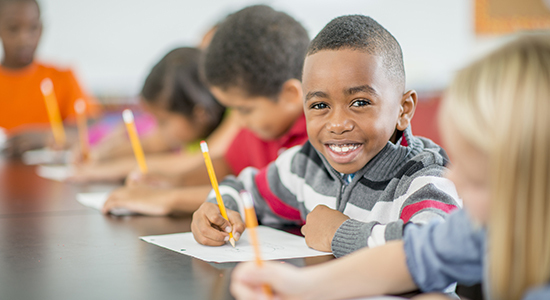 For our first post, however, we want to join a different conversation: the question of whether handwriting instruction in elementary classrooms should go by the wayside. This has been hotly debated ever since “Handwriting is History” first appeared online. Throw in the fact that the ELA Common Cores are silent on the topic of handwriting (while saying plenty about essential writing skills), and the decision by some districts to make handwriting instruction optional after second grade — what are teachers to do? Posted in The Inspired Writer BlogTagged 6 Traits, brain research, Common Cores, graphic organizers, handwriting, keyboarding, SATLeave a Comment on Is the Pencil Becoming Obsolete?